Arrow Sewing Cabinets: Hey, it’s me –Olivia. I snuck onto my owner’s computer and posted this because I’ve got a big problem and I need some help from all of my Arrow Sewing Cabinet sisters out there. My owner seems to think that I’m too “pretty” to do any real work! She put me together right away when I arrived on her doorstep, so I thought I’d really be cranking out the sewing projects. NOT! I have been languishing around her craft area for months with nothing to do! A couple weeks after I arrived, my owner went to a quilt show and came back with a bag. Oh, I was so excited! I thought she had gotten some cute fabric, and we were getting ready to make something. 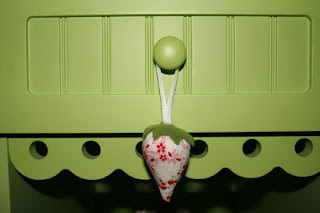 She reached in to the bag, pulled out a strawberry-shaped pincushion, and hung it on my knob. She then made some comment about how cute it looked on me, and then walked away. C’mon lady! I know I’m gorgeous and can wear just about anything (Heidi Klum – eat your heart out), but I’m also a tough cookie. I was born to sew! Next, she came home with a bunch of paint chips trying to match my beautiful shade of green, and mumbled something about coordinating shelves. All of a sudden, two lamps in my shade of green appeared. Really? Do I belong to a shopper? I was in despair. A few weeks ago, I thought I had finally hit the jackpot. My owner walked in with three big rolls of fabric from Jo-Ann’s. Woohooo! But wait, where was she going with that sewing machine? She swiped it right off of my top – and took it to the dining room table. You have got to be kidding me!!! Last night was the final straw. My owner walked in with a pair of glass cakestands and said how pretty they’d look on me, piled high with jelly rolls. I knew then that I was going to have to do something drastic to make her realize that I am not just another pretty face. That’s why I’m hacking into the Arrow blog and posting this. So please, I’m begging all of my sewing cabinet sisters – Betty, Auntie Em, Lucy, Auntie Oakley, Marilyn, my fellow Olivias, and even little Pixie – PLEASE post a comment and tell everyone how much work we can do. I know my owner reads this blog, so maybe it’ll help her see the light! Oops, gotta go – I hear footsteps! If your owner doesn't start treating you right...I'll take you home and put you to proper use! Don't be fooled...Olivia works harder than any dining room table you've ever met! A woman that is forced to sew on the dining room table. Olivia...if you are willing and available, I have the perfect sewing machine you need to meet. I would be willing to whisk you away from all of that madness! Simply say the word, I have the perfect place in my craft room for you! You would compliment my yellow walls perfectly and I could put my little sewing machine somewhere that she would actually be used! Olivia :) come on over here girl, I would put my nice Bernina on you and we would make beautiful things together!!! Olivia, do not despair. I'm sure some lovely Xmas projects are soon to come your way. 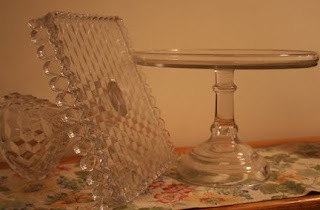 I know I would love a cute table like you for my sewing machine! Come on-a my house, my house, I'm gonna give you candy, (Not really, but wow, would I put you to work.) There is so much to sew here that you would be very happy. Every night when I get home from work I would set you to humming along with my baby - the BabyLock. And then some nights I would surprise you with a serge of delight. Come on-a my house, my house, I'm gonna give you Everything! Hi Olivia - It's me Gidget. Okay, I know you wanted your sewing cabinet sisters to post and I'm only a table, but I can do a lot of work too! When I'm not in flatbed position holding my owner's machine, I can be used as a work surface. When the sewing/crafting session is over, I can be folded flat and put in the closet, or throw a tablecloth over me and I'll be happy to hide. Hope your owner sees the light soon.